1-15 oz can peas, drained or about 15 oz frozen. Place potatoes in large pot of warm salted water and bring to a boil. Reduce heat to a simmer and cook until tender but not mushy. Drain, rinse with cold water, and set aside. Meanwhile, heat the oil in a large dutch oven and add the onion. Cook about 7-10 minutes until tender and translucent. Add garlic, cumin, cayenne, curry, garam masala, ginger root, salt, tomatoes, coconut milk and garbanzo beans. Bring to a simmer and cook for 7-10 minutes, stirring frequently. Add cooked potato, steamed cauliflower and peas. 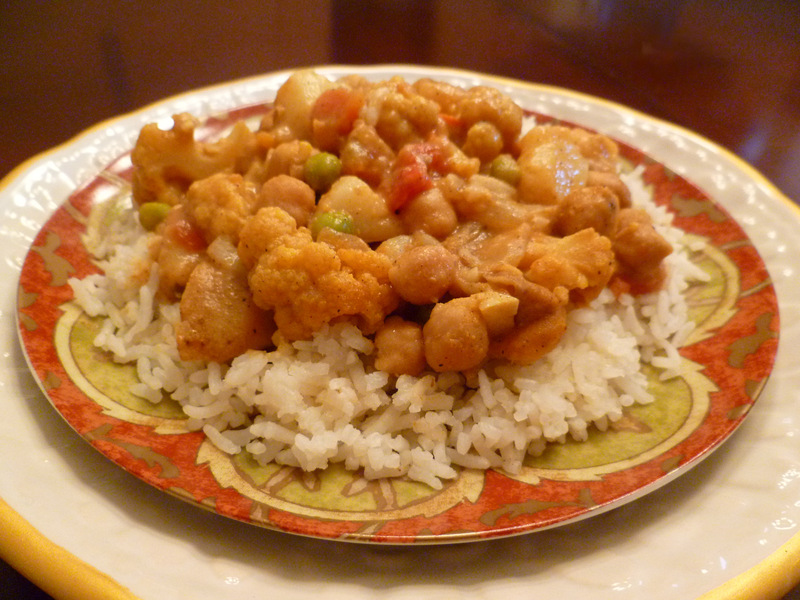 Simmer until potato, cauliflower and peas are warmed then serve over jasmine rice. You may want to try half of what I use for garam masala. Some brands are more pungent than others. Then add more little by little if needed. I know this seems like a lot of steps with cooking the potatoes and cauliflower separately. You can cook the potatoes as described and to lessen a step, cook the cauliflower in the pot of curry once you add the tomatoes and coconut milk. You will then have to simmer until cauliflower is tender. However, if you do this, you’ll have to keep a close eye on the pot, stirring frequently to make sure the bottom doesn’t burn. I have found that although cooking it separately means one more pan to wash, the dish comes together faster when steaming it separately and with less time spent over the stove than if you cook the cauliflower in the pot all together. This is very versatile as far as the veggies you can add. Feel free to use your favorites. The texture of the cauliflower and potato give enough variation that even omnivores tend to love. Keeping them in larger chunks makes the dish “meaty”. Beautiful! I attempted a similar curry last night, but alas, I forgot to grab coconut milk when I was gathering the rest of the ingredients. Without having the coconut to tone it down, the garam marsala in mine overpowered the whole thing, I was so bummed. Your recipe, however, looks delicious! I will try it out next time I get a hankering for curry, thanks for sharing!